Last week at The Boston Design Center’s “The Look” event, I took in an exhibit of clothing that belongs to the inimitable Boston fashionista and event planner Marilyn Riseman. I knew Mrs. Riseman in the 1980’s when I worked for a small opera company where she was a patron. She was certainly one of the first truly “I am who I am” kind of people I’d ever met. Her style remains consistent to this day: predominately black and white, some red; white and black Kabuki-inspired maquillage and a sharp black pageboy haircut. Now in her mid-80’s, she still has the big presence that she always had despite her tiny frame. More on Mrs. Riseman here. The cloths in the collection were simply fabulous in both style and quality of detail. 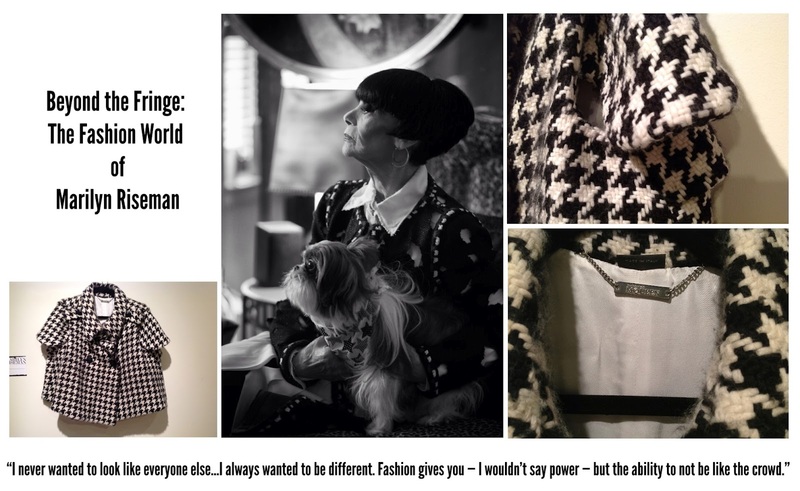 I was immediately drawn to the room with the black and white houndstooth check jackets, especially the Alexander MacQueen shown above. (Jacket photos by me). The detail was exquisite – the little cap sleeves over open arm holes, a little caped back. Love. I’ve recently developed a renewed obsession over the black and white houndstooth check pattern, which we’re seeing more and more of. Officially classified as a “Scotch Plaid”, the houndstooth (or dogstooth or puppy tooth) check was never associated with a specific Scottish clan and could safely be worn by anyone without causing offense. Its broken check is made up of alternating four dark threads and four light threads in both the warp and weft of the woven fabric. It is believed that the pattern originated in the 19th century and was first mentioned in Merriam Webster in 1936. It’s an amazing pattern, I think, because it’s so flexible and is both classic and modern. It works in miniature (aka Puppytooth) or as an over-scale pattern. Several years ago, I had a houndstooth check jacket that I made that I just loved and am wishing I still had! 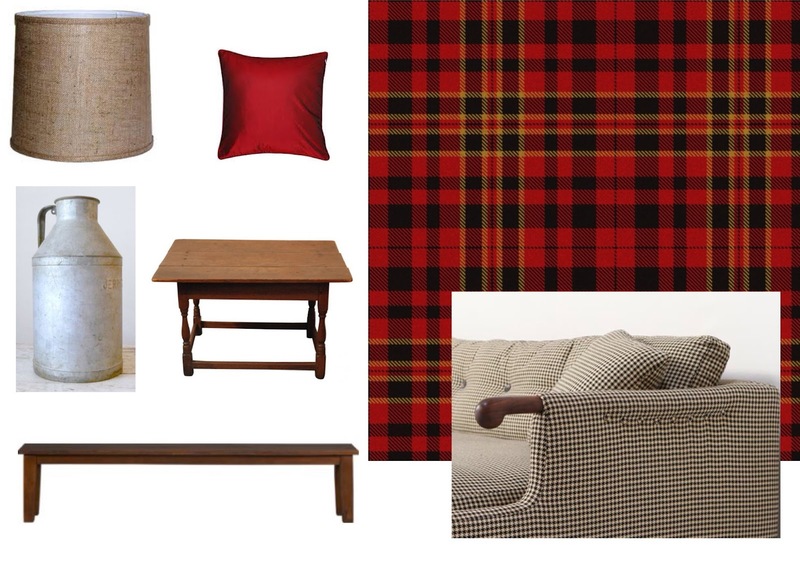 I’m currently working on a design plan for a small library room in a New Hampshire farm house and have been playing with a couple of brown/tan houndstooth fabrics as part of the mix. I’ll keep you updated on what is decided. Meanwhile, the combination of black and white houndstooth with the color red reminded me of the family room in our New Jersey house when I was in elementary school. The family room featured dark paneled walls, a red and black plaid wall-to-wall carpet and a black and white houndstooth check sofa. My parents also incorporated a pair of tavern tables with vintage galvanized steel milk jugs turned into lamps and topped with burlap barrel shades. The coffee table was a simple long parson’s bench (not to be confused with the über stylish Parson’s tables). I think it was quite a bold statement – pairing the large plaid with the small check – bravo Mom and Dad! It’s one of their rooms that is truly seared into my memory. And some of my collected favorite images, with details on my Pinterest Board. Have you used houndstooth in your home or project? Feel free to share links below!